North Carolina Hot Wheels Association: Since 1998! Pic of The Day! Click Here .. The 2017 Edition of the Hot Wheels Treasure Hunt Price Guide has been released, along with a Blackout Edition! The big improvement for this year: Short Card values have been added, along with some other really good features! Guides can be purchased through Amazon by going to my Amazon Author Page here! Thanks for all the amazing support on the 2016 Edition! New BLOG Feature! I gave the WordPress blog application a shot, and found out that I loved it! It's so much easier to use than creating an HTML article here on the website, so I'll have something new almost daily! Very easy to use. This blog also features a user-friendly comments section, so please feel free to comment on the articles. I'd love to read your feedback! .... .... More Ways to Connect to NCHWA.com! Be sure to connect with us at Facebook, Twitter and YouTube for more Hot Wheels information. Just click any of the links to the left, and you're there! The Hot Wheels logo is the intellectual property of Mattel, with which the NCHWA is not affiliated. The NCHWA "Phoenix" is the property of, and copyrighted by NCHWA.com. The North Carolina Hot Wheels Association web site is authored and maintained by Neal Giordano. 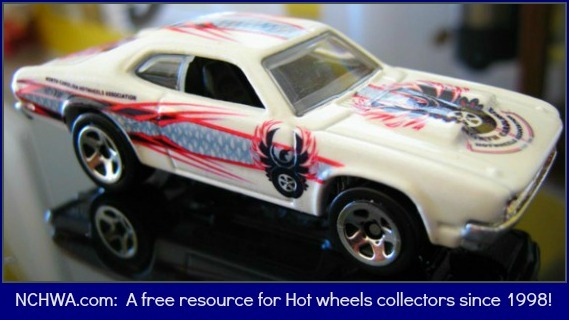 It is a Hot Wheels online information resource provided by NCHWA.com ("North Carolina Hot Wheels Association "). The entire contents of the Site are protected by international copyright and trademark laws. The owner of the copyrights and trademarks are Neal Giordano, North Carolina Hot Wheels Association, its affiliates or other third party licensors. YOU MAY NOT MODIFY, COPY, REPRODUCE, REPUBLISH, UPLOAD, POST, TRANSMIT, OR DISTRIBUTE, IN ANY MANNER, THE MATERIAL ON THE SITE, INCLUDING TEXT, GRAPHICS, CODE AND/OR SOFTWARE without permission. You may print and download portions of material from the different areas of the Site solely for your own non-commercial use provided that you agree not to change or delete any copyright or proprietary notices from the materials. Now that the legal mumbo-jumbo is covered, I hope you enjoy the website! It's been a labor of love over the years, and my goal was simply to provide a decent resource for collectors. Have fun with your hobby, don't take it too seriously, and remember to include the kids, when possible!